Sabina Iqbal was invited as a guest speaker at the CODA UK & Ireland Conference 2010 in Brighton Deaf Centre, on Saturday 21st August 2010. The theme of the conference was ‘Positive Attributes of having Deaf parents’ where CODA (child of Deaf parents, formerly known as HMFD, Hearing [me], Mother, Father – Deaf) shared their positive insight/ experiences of having Deaf parents, explaining how having Deaf parents with rich Deaf culture and heritage have shaped onto CODA’s lives. Sabina gave a presentation about Deaf Parenting UK and the work they do in enabling, empowering and supporting Deaf parents/ parents to be. Many CODA and Deaf parents were at the conference who found the conference useful in sharing information/ experiences as well as networking with new and old friends. 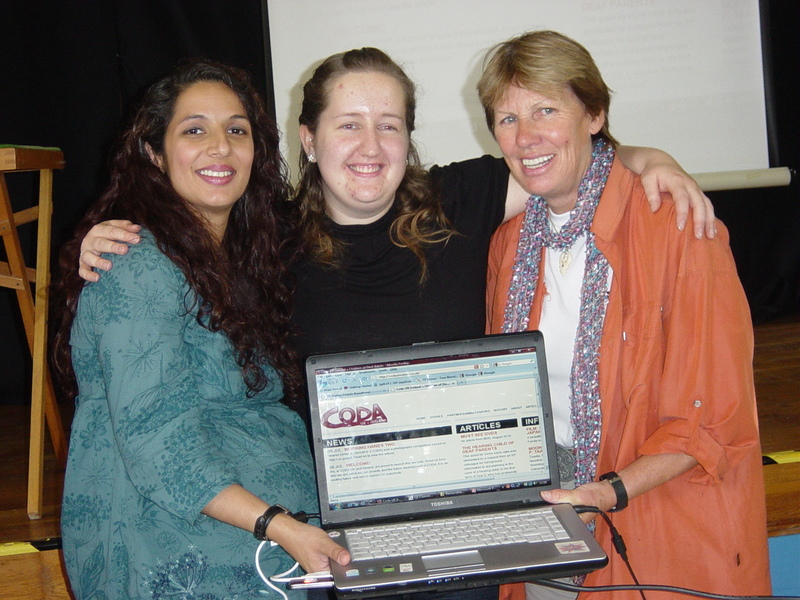 From there, Sabina (Deaf parent) and another guest speaker – Carmel (CODA) from Australia, were invited to launch the new CODA UK and Ireland website. Here Marie Dimond, Founder of CODA UK & Ireland explained that there is lack of information on CODA in UK apart from brief info here and there but no central resources of information for CODA. As a result, Marie was involved in obtaining funding and got someone to design the website, she also gathered together all CODA information/ events and some useful resources on CODA issues and added them all onto the website. Any others who want to show their support and celebrate the launch of the website! “I’m delighted to be working closely with CODA UK & Ireland to exchange our support of our respective organisations in reaching out Deaf parents and their children who are CODA themselves. Through the partnership, we are reaching out to the wider audience and promote positive images of Deaf parents and the well-being of CODA too. I was also delighted to be at the CODA UK& Ireland conference: Positive Attributes of having Deaf parents, on 21st Aug 2010 at Brighton which was successful. I have seen many Deaf parents, their children/ CODA, dispersed across UK who are socially isolated with limited access to support and the conference is one of the event which offered a fantastic opportunity for Deaf parents, children/ CODA to get together, learn from one another aswell as to have fun.